#ROHlescaut Pappano and the ROHOrchestra are magic together, like Des Grieux and Manon. They sound dull with other lovers/conductors. Great to hear some proper stonking voices in #ROHlescaut... Sondra Radvanovsky sounding glorious. Wonderful to hear @SondraRadvan scoring a big success in #ROHlescaut - thrilling heft, great delicacy amd eveything in between. Brava! 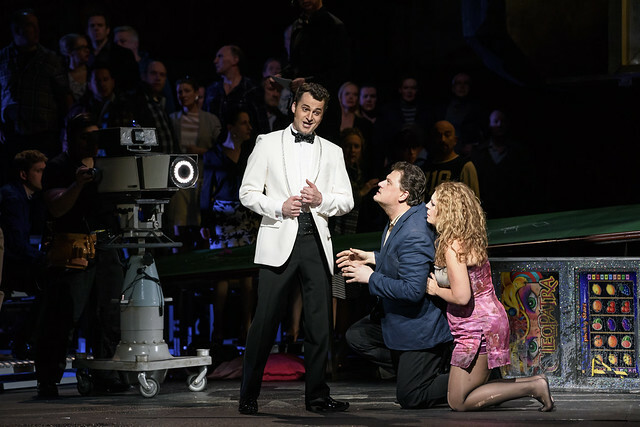 What did you think of Manon Lescaut? Manon Lescaut runs 22 November — 12 December 2016. Tickets are still available. Singing by the principals, very good and committed. Brilliantly conducted by Tony Pappano and played by the Orchestra.. Hearing the Intermezzo was worth the ticket price, alone! The production didn't seem to make any more sense than it did two years ago, when new. Saw Manon Lescaut on 26th November. Absolutely fantastic singing, conducting and orchestral playing, illustrating how Puccini's writing was quite "symphonic", and influenced by Wagner. Sondra Radvanovsky's singing itself was worth the ticket price. The production was very visual and at times stunning. The updating worked reasonably well and was thought provoking. However the visual messages often being quite brutal sometimes did not fit with what is basically a love story. A brilliant show. A very topical subject of Rags to Riches to Rags. Fabulous performances and a wonderful score conducted by Antonio Pappano. Seen it twice. Will definitely be going again. This was billed as thought-provoking and it did provoke me to think why was I watching such a dreadful production? Good cast, sometimes drowned out by the orchestra, bizarre staging and very difficult to understand the story, I'm glad I'd seen the ballet beforehand. Another one for my 'don't go again list'! Jonathan Kent can ignore the Telegraph and be very proud of his achievements. This one is here to stay. Absolutely loved the vocal performances - a privilege to be there for such stunning talents - but the setting just didn't deliver ... particularly Act IV - how does a distreesed flyover equate to dusty plains? Wonderful singing particularly from the leads and gorgeous playing undermined by the crassness and vulgarity of the production. The plot was rendered incomprehensible and the visual ugliness of the whole thing and the final act in particular beggared belief. There is nothing thought provoking here - it is totally overworked and increasingly unpalatable. But well done to the cast and orchestra for what the pleasure they gave. Best watched with eyes firmly closed. We really loved this performance (on 26th), and the whole experience at the ROH on our first visit. We loved the rich and expressive playing of the orchestra with AntonioPappano - thank you ROH. Vu le 26.11. Les chanteurs étaient excellents, Sondra Radvanovsky sublime comme toujours, la direction d'orchestre sans reproche. La mise en scène n'est pas nouvelle ; difficile de moderniser intelligemment : acte 2 génial, acte 3 raté. Il faut y aller quand même ! Sondra Radvanovsky sang amazingly. The end love scene was one to die for. Papano's conducting strong and matching as usual. Enjoyed it last night. Dulcet toned Massimo Giordano was fine as the stand-in, if a bit overpowered by excellent Radvanovsky. Luis Gomes's colourful singing as Edmondo stood out in Act I and like Levente Molnar, his acting projected to the cheap seats which I always appreciate. A vividly designed and audacious reimagining which I'd give three and a half stars with last night's cast and happily watch again. Loved the singing and music as ever. But the art of transporting the audience to another place has to include a visual component too.In this case I found only distraction and confusion. The boudoir scene was embarrassing and juvenile. The last act was a wasted opportunity because the audience could not share the experience. I found myself reacting to the clumsiness of the set rather than the torment of the lovers. I long for a complete experience from the ROH but sadly not this time. Jonathan Kent's production is inspired and left me with the idea that the souls of the two lovers literally dried up as a result of the modern day cynicism of reality TV and mob justice in our modern day, beyond truth, social media obsessed society. A fantastic production wonderfully brought to life by Sondra Radvanovsky, Massimo Giordano (Dec 2), Antonio Pappano. Far better than the Metropolitan Opera production from last year. Sondra Radvanovsky's voice was the most positive and enjoyable element in the performance...colleagues could not match her but there was no chemistry between her and her male lead. The staging was quite clever but mode of dress was out of place for the period. Co-ordination of the staging was unprofessional - delay between acts 3 and 4 while they organised the change. Definitely not a slick arrangement. The performance seemed more suited to the ENO than the ROH so disappointing to say the least. I will go against the grain and say that I loved the staging. 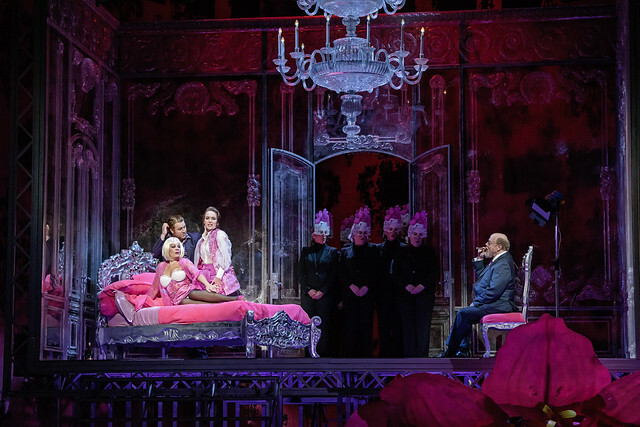 Being new to opera I appreciate the updated staging; the juxtaposition of the story and the modern day treatment of reality television. Superb singing from the leads but also excellent support from the chorus. The baying of the crowd and the terror in the eyes of the other deportees was very powerful. A slight mismatch in the two leads - I prefer Jonas in the role as on the Blu-ray. A top evening at the opera. Thank you ROH. To my exceptional and sophisticated taste, I shall admit that Sondra Radvonovsky sounds great and the most impressive aming her conterparrts female sopranos. Her lead Aleksandros were also suprisingly ( for me) astonishing! I lkiedd the staging- that was reflecting Italian contemporary elegance with modern , balanced touches. Yet to add , thay made me crying all last act long and that was amazing! Bravissimo!